We’ve been planting a hedge at the Crossroads. You see, we live where two heavily traveled roads cross, and we’ve been thinking now for a few years that a hedge might add a little more privacy to our corner. We debated about what type of plant we would use, but we settled on waxleaf ligustrum. It’s a tough, old-fashioned plant that’s been around forever. It’s evergreen here in the South, grows rapidly, and requires little care. It will get tall and bushy rather quickly, particularly if you keep it pruned. 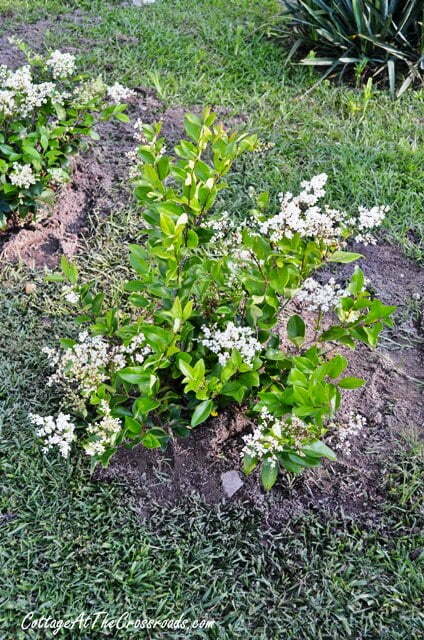 Ligustrum, sometimes called privet, will grow in part shade and full sun. 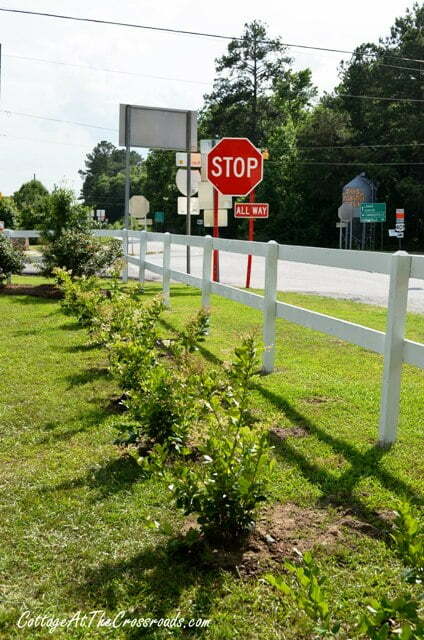 Ligustrum is so commonly used as hedges they’ve become known as privet hedges. In late spring, they produce white flowers that are magnets for bees. After they flower, you can start shaping them up. We are very familiar with these plants as we had some growing as a hedge at our former home. They excel as a hedge but are not pretty foundation shrubs. Leo has been planting these shrubs for the past two weeks. 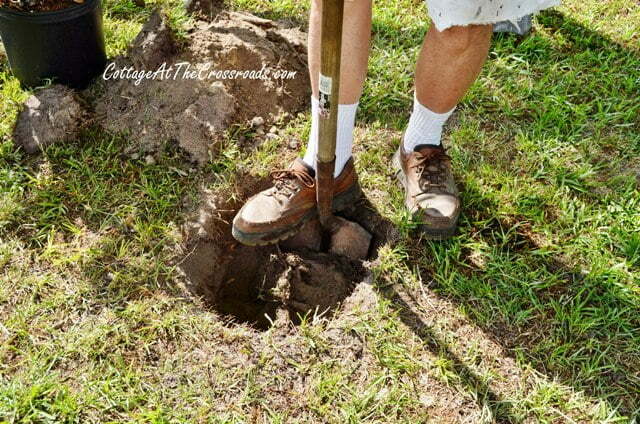 He had to get out the ax to chop through a few roots while digging the holes. He dug the holes nice and deep, about twice as large as the container that they came in. Next he filled the hole with water. Now here’s the secret to successful planting of shrubs-peat moss! 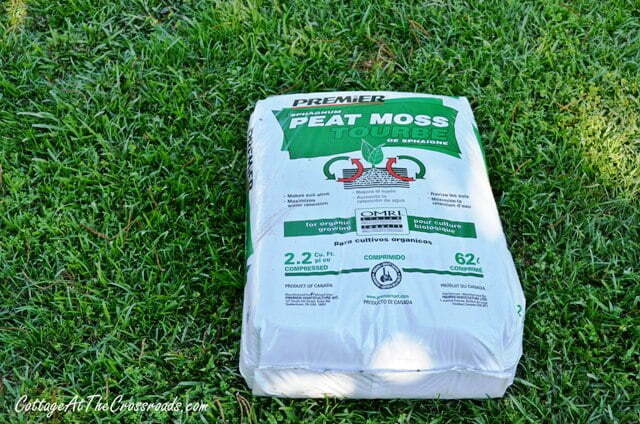 Peat moss retains moisture around the plant roots and keeps the soil loose. 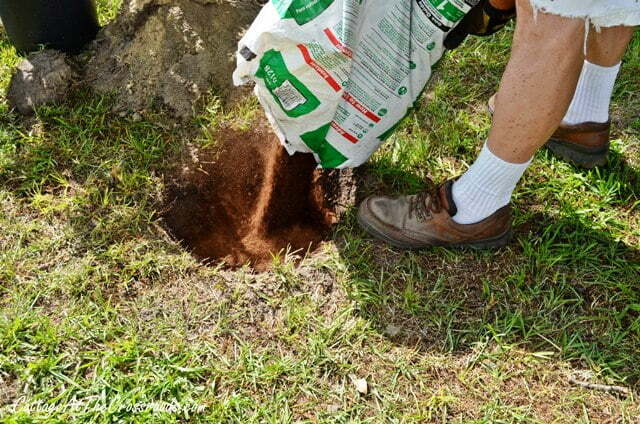 After adding water to the hole, he pours in the peat moss and then adds the plant to the hole. Then he takes his foot and presses the plant into place. And he comes around to the other side and does the same. Bless his heart! He did that 27 times! But we have a hedge now, and with the rain that we’ve been having this week, it will be tall and bushy before we know it. Do you have any picture of the hedge now? I would love to see updated pictures! I was just thinking when we recently trimmed the hedge that we needed to show what they look like now. I will try to get some photos tomorrow. Hello, we are considering planting these but are unsure of the growth rate. Do you have any updated pics? Dave, I will post some updated pics soon, but in the meantime, I’ll send you a few by email. Sending you some recent photos by email. 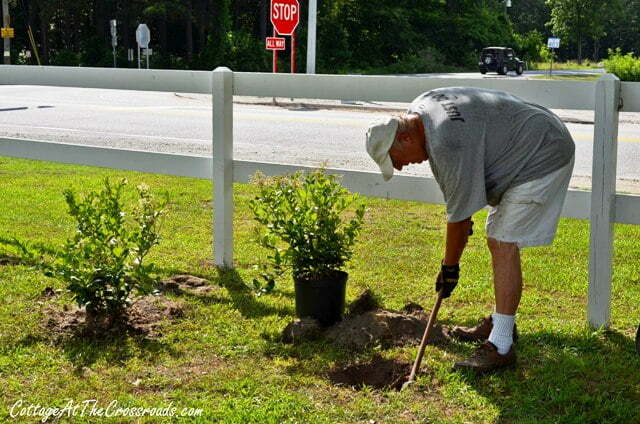 I would also love to see how the hedge turned out and how long they’ve been planted, if you could be so kind. Thank you! Just a quick note about .insect damage. If you take a white piece of paper and place it under a branch, then tap the branch and see if anything is moving . If the leaves start to brown and they ]have a spotted look to them then you need to treat for mites. I see it’s been a few years since Leo planted your Privet hedge. Any chance of updating your photo’s to show the 2 year growth? Thanks! Tim, we will be fertilizing them soon and plan to take some photos when they are blooming again. Thanks for asking about their growth! We’re about to plant a hedge soon and would love to see the results too! How far apart did he space each one? Were these 5 gallons? Michelle, we planted them about 6 feet apart. Some of them have grown and filled in beautifully yet others have been slow to grow. Right now I don’t like the irregularity of the hedge but we’ll just keep fertilizing and shaping until they all fill in. Privet is beautiful as a hedging. in Victorian times in England most houses and parks had privet sheltering their gardens and yards. it is close growing and is ideal for the smaller birds to basically live in . unfortunately its being replaced in England by Laylandii and that’s a rubbish plant offering no protection for small birds and animals and dries out the soil quite a distance around. 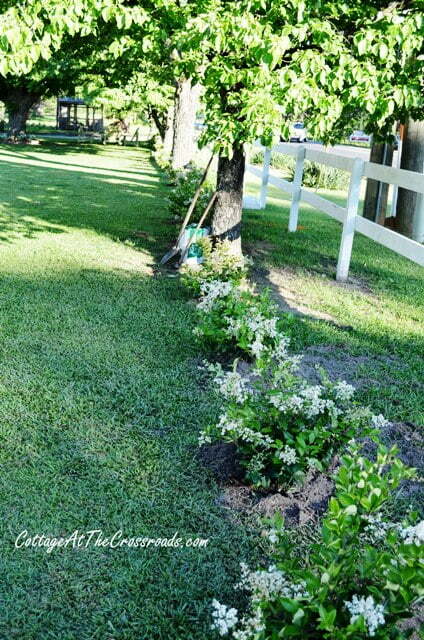 but privet roots go down deeper and allows a close flowering plant and protects it. That encourages bugs also which is food for the birds. I don’t plant impatients , though they look brill they do not have any nectar for bees and other insects that birds like to eat. so they are really a bad thing for ecology. I am trying to get more privet used in road safety as it is a good thing to fall againt say if knocked off a bike or scooter. it gives whereas a solid fence or wall doesn’t give. there would be less injury if more privet was used at junctions or bends. It also cuts down sound. a good all rounder. Hi! 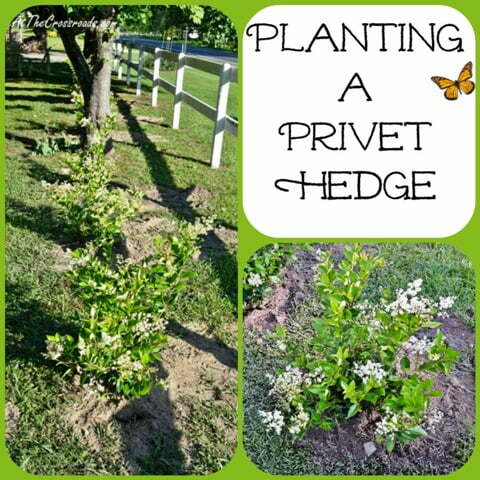 I just found your site through Pinterest when I searched for privet hedges. Everyone says they grow quickly, and easily, but I was wondering how tall, on average, they will grow per year? Do you have any follow up pictures to this post? I searched through your blog from today, 8/22/14, to this how to post and didn’t see anything. I live in Baltimore County, MD, also live on a corner lot with zero privacy, and would really like to have a living fence but I’m sure I would need close to 100 of these bushes like your other reader had to plant! Thanks for the great tutorial and I look forward to updated pics if you can please!! 🙂 Thanks! Thanks for the step by step instructions. 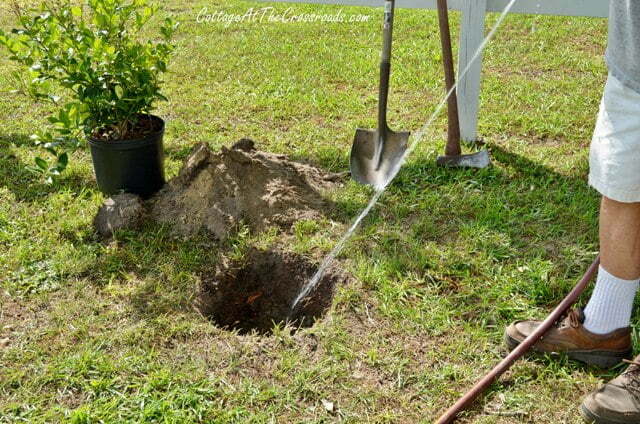 This has really encourged me to get digging! Good job both of you! About trimming the hedge, should it be done at a certain time of the year? Marcelle, the bushes can be trimmed after they bloom in early spring. They can grow as tall as 10-12 feet, so to control the height and to make them bushier, they will need to be trimmed several times over the summer as well. 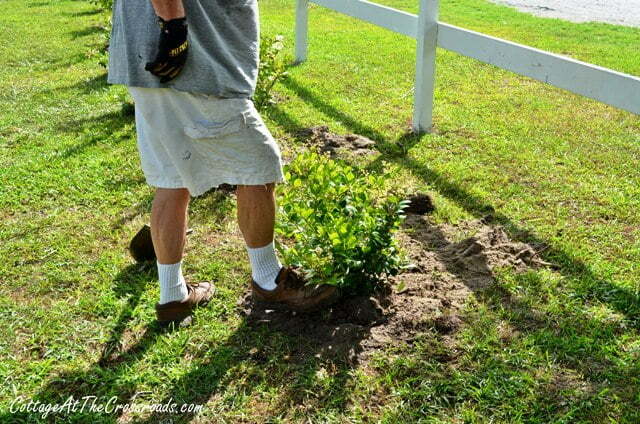 Privet should be trimmed when the shears are sharp. Thanks for that tip, Ed. And an added bonus is that the bees are crazy for the blooms on this tree-so they will maybe stay around and pollinate your vegetables! Ah, I love hearing a good old southern Bless His Heart! We have 50+ year old privet in our yard – a huge hedge giving us privacy. My neighbor used to handle the pruning and shaping but since he’s moved, it’s become my hubby’s job! Give Leo a massage asap! I just did a post on a tour of a lake home you might enjoy. Now I need to check out your home tour on this page! That hedge is going to be the perfect solution to give you privacy and the flowers on them are pretty too. Poor Leo. I’m the planter here (most of the time) and I know what hard work that had to be. Send that man for a massage! 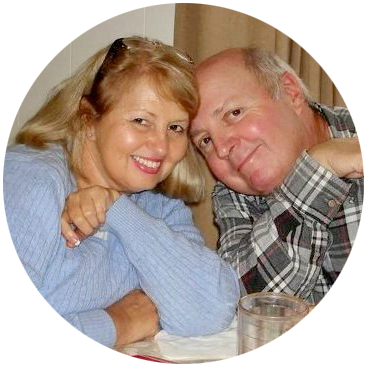 We had that a line of those shrubs in Florida and yes, they grow very quickly and I love their blooms….that Leo…what a guy…that was a hard job planting 27 shrubs!!! !…The privacy hedge will be beautiful! This looks like a very big job but it will be a satisfying one when you are finished. Do you have any plans I could use to build a small deck on the back of my house ? Don’t they also have a good smell when they bloom? Keep Leo Busy girl! This hedge will grow to 8 or 9 ft if you let it. We planted over 100 plants around our yard at our first house..we were young and couldn’t afford a fence …we used 1 gallon plants ( then $0.99 ) apiece and in a few years we had to have a ladder to trim them down! Have kept up the tradition at our next house but with a fence we only needed them in certain spots. They don’t seem to be prey to any bugs either. Good luck! Wow this is a huge undertaking but I think you will have great rewards for doing this when it all fills in to make a hedge. The choice of plant is pretty. Great advice about the peat moss! I love privet hedges and you are brilliant to plant something that blooms too. Can’t wait to see it grow.! 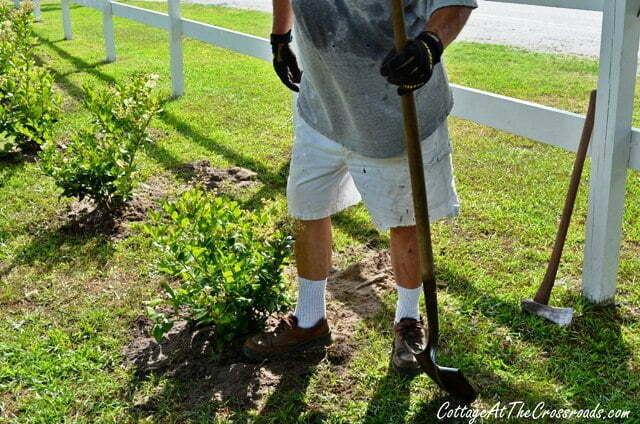 Your hedge will be gorgeous!